By Revilo P Oliver. By Professor Revilo P Oliver. The author, a professor of Classical philology, Spanish, and Italian at the University of Illinois at Urbana-Champaign, was one of the most outstanding and prolific writers in favour of European causes in the period following the Second World War. Part of Revilo P. Oliver’s ongoing “education” in the post-World War II conservative movement was his realization that Christianity was part of the problem, i.e., that the desire to conserve Christianity made it impossible to conserve anything of genuine value. Christianity, he concluded, teaches false values that promote weakness and irrationality. The role of the Jews in the Bible also gives them enormous and detrimental spiritual and secular power in Christian lands. Beyond that, Christianity is the product of an alien culture and race, which has thus constricted and perverted all aspects of the Western soul and civilization. If the white race is to save itself, he reasoned, it will have to free itself of Christianity. Thus Professor Oliver abandoned his earlier attempts to accommodate Christianity, such as his book Christianity and the Survival of the West, and became an increasingly open and trenchant critic. The Origins of Christianity is Professor Oliver’s attempt to understand Christianity by situating its origins in the broader context of what Spengler called the “Magian” culture, which is ultimately rooted in Persian Zoroastrianism. Begun in 1980, it was left unpolished on his death in 1994. 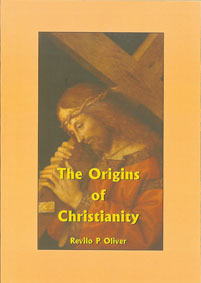 The Origins of Christianity, like Professor Oliver’s other late work The Jewish Strategy, is one of his freshest and frankest books. Approaching the end of his life, he wears his immense erudition lightly as he seeks to pass on the most urgent and hard-won truths necessary for the survival of Western man. P/B 208pp.